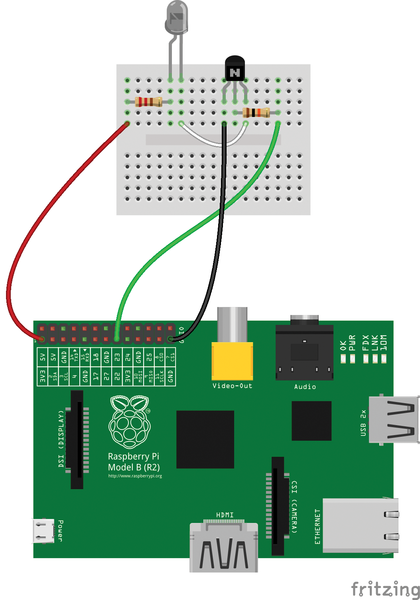 Connect an LED with a limiting resistor to Raspberry Pi's GPIO pins, and you can control the diode using code written in your preferred scripting language. However, if you can make the LED blink using the Raspberry Pi, couldn't you turn the little machine into an infrared (IR) remote control using an IR LED instead? It's possible, but it does require a handful of additional components and some work. Although the idea of turning a Raspberry Pi into a glorified IR transmitter might sound like an interesting academic exercise, the final result can be used as a versatile replacement for a humble remote control. The most obvious advantage of using a Raspberry Pi-based IR remote control is that you can program it via scripts. You can also add some clever functionality on top. For example, you can write a simple server that makes it possible to access and control the Raspberry Pi-based IR transmitter from any machine or device. Although you can connect an IR LED directly to GPIO pins on the Raspberry Pi, the LED's output signal will be too weak, and the IR transmitter will have a very limited range. 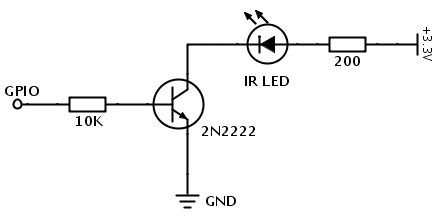 A simple transistor circuit solves the problem by amplifying the current output from a pin and thus increasing the IR LED's signal strength. To build a transistor-powered IR transmitter, you need two resistors (220ohm and 10K), a transistor (2N2222, BC547, or practically any other transistor will do), and a 940nm IR LED. Additionally, you'll need a breadboard and jump wires to assemble an IR transmitter prototype (Figure 1). Wire the components as shown in Figure 2 to assemble the IR transmitter. The next step is to check to see whether the IR transmitter actually works. To do this, you can use a simple LED Python blinking script (Listing 1) that turns the LED connected to pin 22 on and off. Figure 1: Transistor-powered IR transmitter schematics. Because the IR LED is not a regular light-emitting diode, how do you actually find out whether it blinks or not? You can use a camera with an LCD screen or smartphone camera. Point the camera at the circuit and look at the screen. If the circuit works, you should see the IR LED blinking. If everything works properly, your camera should fire.